← Friday Mayhem, aka What Else Is New? I remember making collages in school, but haven’t done it again until recently. In January, I attended workshops at our church on various spiritual practices: meditation, the Zen of drawing, and also one based on the book SOULCOLLAGE by Seena Frost. 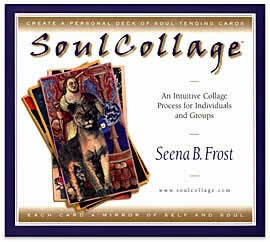 According to the SoulCollage® website, it is a process for “accessing your intuition and creating an incredible deck of cards with deep personal meaning that will help you with life’s questions and transitions.” I am a control freak but I managed to let go and enjoy this process. I hope to find time to make more cards like this, maybe at a retreat sometime. And this week, I made my first story collage. I first read about this process in an RWR article by Jennifer Crusie, “Picture This: Collage as Prewriting and Inspiration” also available here. I was curious about the process, knowing that it worked for authors I admire including Crusie, Jo Beverley and others. Although it is designed for prewriting, I thought it might help me to reconnect with my balloonist story, which has been sitting half-finished for over two years now. It was fun. I used all the images I’d already been collecting to inspire the characters and the setting. Browsing through craft stores, I came up with some cool finds: the perfect brilliant blue silk, cloud patterned paper. As I was cutting the black fabric for the lower part, my scissors snagged and created a jagged pattern, like clouds of smoke, and I decided to keep it that way. While I didn’t get any new ideas, making the collage reminded me that I do have a real story to tell. I will definitely try this again the next time I start a new story. Have any of you tried collage as a creative and/or spiritual process? Did it work for you? Are there other processes you use to tap into your intuition? This entry was posted in Uncategorized and tagged collage, Jennifer Crusie, Jo Beverley, Seena Frost, SoulCollage. Bookmark the permalink. I can’t believe I never read this article. What a GREAT idea! And I just love all the pictures on your collage. I am totally dragging the hubby to Michael’s today for supplies. *squee* Thanks for sharing! 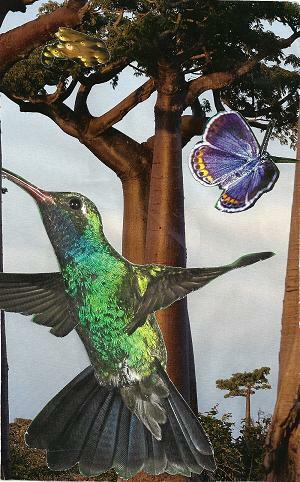 My friend, Elizabeth Holcombe used to do a collage workshop at our Washington Romance Writers Spring Retreat, which is still open (until Feb 20) for registration if you are an RWA member. It’s a great process, using different parts of your brain. I love your collage, Elena! I’ve heard of this before, but never tried it myself. 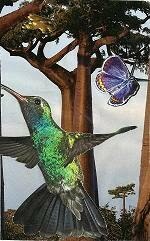 I love the hummingbird/butterfly card. I also like your balloonist collage. I’ve always made sure I had pictures around me that inspire me, but I never thought about being story specific. I’d like to try that. I don’t do a collage, but I do similar sorts of out-of-the-box brainstorming. I make playlists for my manuscripts, I sometimes find poems or quotes that bring a character to mind, I’ll look for faces, famous or otherwise, that remind me of my characters, and I’ve even been known to take my characters virtual horse shopping. I must admit I’ve never done this but it does sound appealing. I have a notebook for each of my books. I have timelines, notes, images of my hero and heroine and sometimes of minor characters and even villains too. I keep copies of lists of references and sometimes even entire articles printed from online in the notebook. If I am just starting a book I keep all the scraps of paper on which I jot bits of dialogue and scenes onto in the notebook. I have a filebox for each book where I keep the notecards I have accumulated for each book also. (I used notecards at work so that I can jot things down as they come to me.) If it is a book I have yet to start, but have lots of ideas on I keep the same things in the notebook as they come to me. This helps a great deal when I finally get to start that book! Still, I might just have to try the collage idea. Very appealing. I like some of your other ideas for inspiration. I’ve never thought of trying a playbill, Susanna! Amanda, your cork board sounds like a close cousin to this collage method. I’ve always liked working with visuals for my stories. I also pick music to write to that somehow reflects the mood for a particular story or even scene. Sometimes I have searched out scents, too. I think other sensory experiences–learning to country dance, ride, cook or eat period foods, also help this way. I haven’t done collage in such a long time. Have had the kids do it or helped them on projects that required it. When I work on things, I just need to spread them out in note form. An idea per page or card. Then I can line them up, shuffle them around, add comments and details. Not artistic, except when I planned summer reading and added in all the art projects I was doing. Kind of like a storyboard. I’ve done two, one of them was pictures I pasted into a notebook– before I started writing the story. Another was a large one I did for a story that was loads of fun to do. Though I didn’t find it a breakthrough method for me, what it did do was disconnect my conscious deliberations and allow my subconscious to comment. I haven’t done it again, but I think if I ever felt horribly stuck, I might try it again, just as a way to get the subconscious cooking and stop the conscious, overly rigid self from butting in.